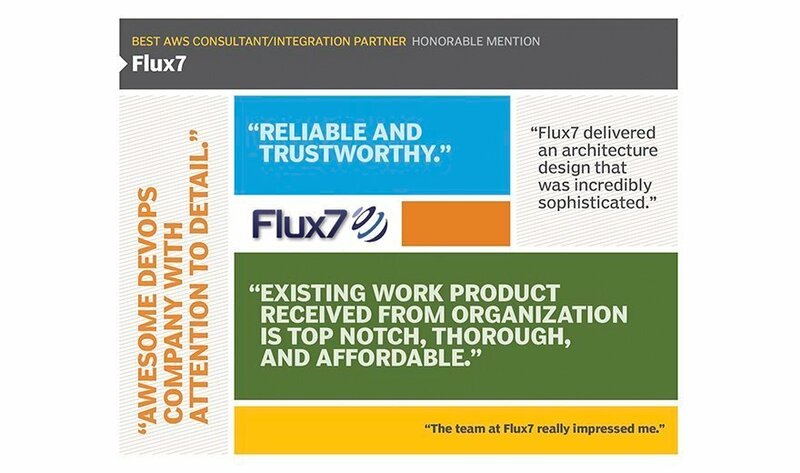 For the second year in a row, readers commended Flux7, an AWS Advanced Tier Consulting Partner based in Austin, Texas, for its stellar AWS consulting services. Voters praised Flux7 for its extremely committed team, highly technical leadership, customer-driven focus and ability to change with the times. "They are very technically capable, up-to-date with the latest AWS technologies, and responsive whenever we have questions or need assistance with our DevOps infrastructure," said Shilo Rohlman, a software developer at Medallion Learning based in Denver, Colo.
Flux7 also jump-started a project for Tessitura Network, Inc., based in Dallas, Texas, among many others. "Flux7 assisted us in developing a prototype architecture for a fairly complex hosting operation," said Ron Wilson, Tessitura's CTO. "Flux7 was … also flexible in tailoring the scope of the project, ultimately providing us with an initial architecture template and supporting automation tooling that we then took internally for refinement, testing and deployment." What workloads reside on your AWS cloud deployment?